TBILISI, DFWatch–A rally was held Thursday to demand the restoration of protected area status for the old Sakdrisi mine in southern Georgia. 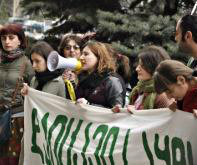 The rally took place outside the National Cultural Heritage Protection Agency in Tbilisi and was organized by environmental activists. As it began, a spokesperson for the agency appeared and offered demonstrators to hold talks. Five of the demonstrators went into the agency and a discussion took place but failed to lead to any results. During the rally, there was an exhibition of pictures of cultural heritage monuments in Georgia, which according to protesters are also in need of protection and restoration. Sakdrisi mine was stripped of its status as cultural heritage on July 5, 2013, in a controversial decision that opened the way for commercial exploitation of mineral deposits there that were also known to prehistoric man. RMG Gold had a license to carry out mining work on the area, but a few days ago, Tbilisi City Court decided to temporarily suspend the license until a court has made a final decision. RMG Gold is appealing the decision to the Appeals Court. Archaeologists have said there are more than 5,400 years old traces of human activity in Sakdrisi, like stone tools, and many fear that RMG Gold’s mining work will damage the historical value of the site.